Wasnt sure where to ask this as its about suspension and the rear axle but here goes. Ive been getting a really bad knock in the back end when going over things like speed humps. Not fast, even gently with a little weight in the back. A bit more poking around and it seems that the extension at the front of the diff seen below (that protects the universal joint) hits the floor before the suspension hits the bump stops. 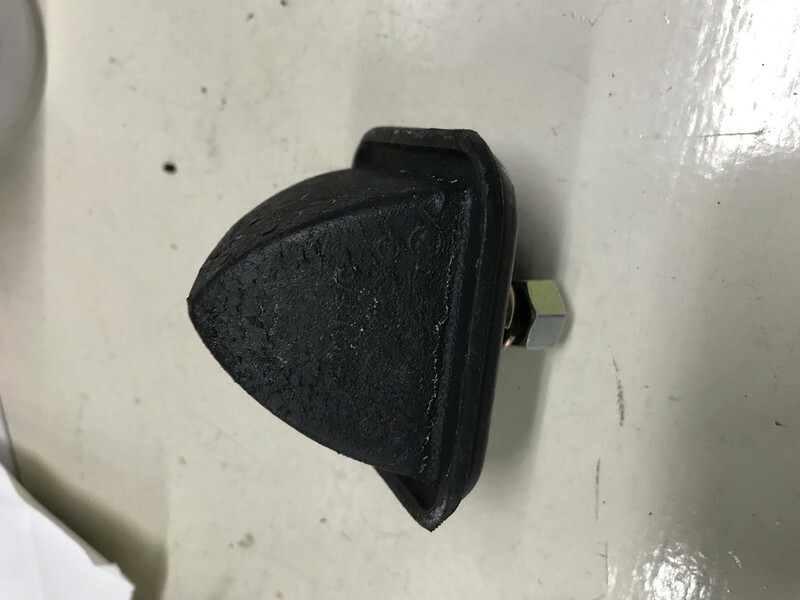 In fact, it doesnt look like the bump stops have evr been touched by the axle but it does look like the bit on the diff has hit the floor many times. Location: Southern Sweden - Sturkö island First of all, the pinion snubber is missing - there's only the stud left. Secondly, the propeller angle looks to be way off specs, due to the lowering block - this will eat up the ball and trunnion and the universal joint. You need to adjust the pinion/propeller shaft angle with wedges (or mill off an inclination on the lowering blocks) (see the fsm for proper pinion/propeller shaft angles) and mount a pinion snubber. First of all, the pinion snubber is missing - there's only the stud left. What is a pinion snubber? Assuming its like a bump stop? Where would I get one of those and what does it look like? My workshop manual does not show it. The angle is also greatly exaggerated because the vehicle is lifted and the axle is at max droop. The angle looks quite ok when at normal ride height. I will measure the angle and adjust. I will check the diff angle tomorrow and find a generic bumper to replace it as I have no hope of getting the correct one here anytime soon. Location: Southern Sweden - Sturkö island The fig. comes from the spare part manual. I think that the lca bumper above might work - just check the stud diameter on your broken one. Location: Netherlands Reinstalling the bumper again will make the axle hit the body happen more often, and noticable, but without the noise. 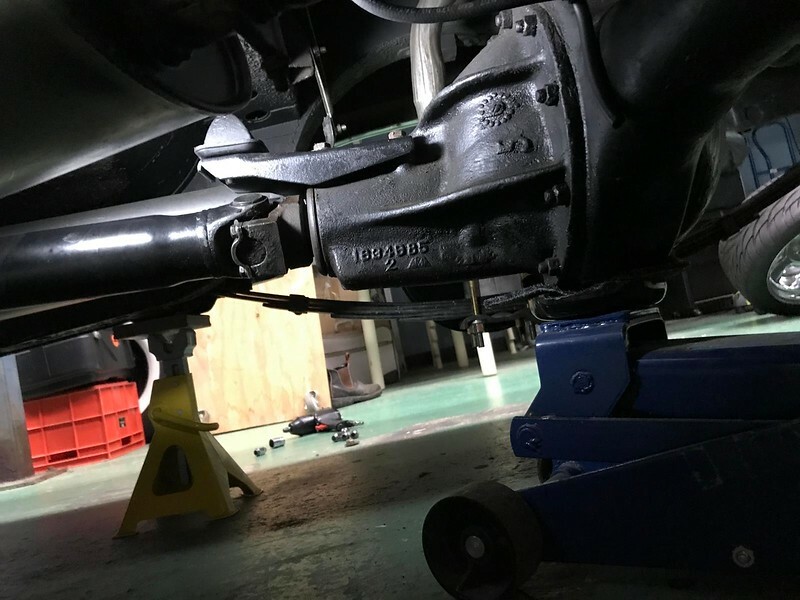 A solution is to lessen the lowering of the car a bit, or maybe better, increase the springrate of the leafsprings by adding a blade per side. I recall I'm still running Monroe SensaTrac shocks on my '60 NY. These shocks have a helper spring around them which add a little extra springrate to the rear suspension. Reinstalling the bumper again will make the axle hit the body happen more often, and noticable, but without the noise. Those Monroe shocks are exactly the ones I wanted but are not available here. I did come across these Monroe air shocks available locally. If you don't have a four pillar ramp lift, find four concrete blocks, lift up the car and let it rest on the blocks. Mind to set the parking brake and block the Wheels. If you don't have a goniometer, then search and download a gravity meter app - those will work fairly good. Loosen the axle tube clamps and install some whatever spacers (nuts, old file etc) until you have the proper angle - measure the spacersshims and you know how much to machine (file) off on the lowering blocks in a wedge shape. Its measured up and it turns out to be about 4.5 degrees or a tad more at the normal height and load. My book says to set it to "about 2 degrees", is that correct? The previous image above is at max droop at about 8 degrees. Im removing the solid 2" blocks, taking 5/8" off and milling the face to 3 degrees. Better than using wedges I think. A little less drop and getting everything a little closer to spec. Location: Southern Sweden - Sturkö island First of all, the car must be in level - check this on the underside of the rockers. In your case you should have to raise the front end slightly when you measure the angles. Practically, the pinion should Point downwards slightly. Yes, you should machine off the wedge on the lowering blocks. It seems like you have the same crap as I bought - aluminum blocks with farmer steel bolts :). The leaf springs will bend the aluminum blocks and you need to retighten the bolst frequently (do not use the correct torque - this will strip out the threads on either the bolts or the nuts. I have the original height on my car, with 1 extra main leaf and the leaf springs has been forged up. In all, this means that the car has a fantastic cornering and roadability, the downside is that I need to use the lowering blocks. Since the car slowly sets the leaf springs down, I sometimes machine off a tad. Location: Sydney Ok, 2 degrees it will be. When I got the wheel alignment done, they reckon the rear axle out. When I mentioned this to someone they said that some USA cars had the axles biased slightly to compensate for driving on the RHS and this was to help tracking straight? There is about 1/4 - 3/8 difference (just measured roughly) between the left and right, the right hand end of the axle being slightly more rearward. Does all this make sense, is it true? Location: Southern Sweden - Sturkö island I'd say that this is a myth. The rear axle should be straight in comparison to the "frame". The leaf springs are different from left to right though, most probably for to compensate for the weight of the driver and also that the Engine is off center to the right. My guess is that the front bushings for the leaf springs are deformed (60 years +) and the rear bushings are worn as well - check and fix this. Location: Sydney Surprisingly all the bushings and springs look relatively new. All look well centred, no cracking or extruded rubber. Im not sure whats going on there in that case. Location: Southern Sweden - Sturkö island Just for curiosity, I just measured my spare leaf springs; the stud has exactly the same position on both of them. Location: Netherlands If there is any difference between left and right springpacks, I think it would be to counter rotating engine-torque through the rear axle gears. Driver-weight would not be accounted for imo because the engine and transmission are already offset in the car. I know performance 'muscle car' Mopars could have biased leaf springs with an extra blade in the driver-side leaf-pack. This is purely to keep the tire on that side planted as much as the other tire. The rear axle being off in the car could very well be factory build-tolerances adding up along the assembly line. Provided the driveshaft is fairly level with the ground too. Pinion-angle should actually be measured against the centerline angle of engine/transmission. Every modernday smartphone has leveling apps available for download to be used as a angle-finder. I always use "Clinometer" on my iPhone. Actually it is VERY important, that the nose of the diff points down a couple of degrees in relation to the prop shaft, regardless if the prop shaft is level to the ground or not, so that under hard acceleration the pinion shaft is more or less in line with the prop shaft. "Angled down" is to the rear right? As in the nose pointing up? Location: Southern Sweden - Sturkö island The pinion (differential housing neck) should be pointing downwards (angled down). In the fsm they refer to the rockers being in level and used as reference. As Herman writes, the centerline angle of engine/transmission is the best reference that doesn't really care about stance or suspension height. However this is somewhat more awkward to measure. Ive machined the blocks shorter and to 3 degrees. Had to reposition the locating pin hole as the angle brought the axle forward enough that it could not locate the pin and there was obvious restriction in the drive shaft moving forward so back to original position. The entire assembly looks much healthier now. The springs are not original. They have what looks like a goldfish in red painted on them and are designated drivers side and RH side. Right hand spring front bushing to locating pin centre is about 5/16" shorter than the drivers side spring. They are both 5 leaf. Difficult to know if your 5 leafs is as strong as 6 leafs. When the rear axle is at it's lowest stroke, the ball and trunnion reach it's maximum travel, hence, most times one must lift the rear axle slightly for to be able to remove the propeller shaft. Id like to find out whether swapping left to right would be more appropriate for driving on the left? Location: Southern Sweden - Sturkö island No idea about the producer, DS could mean drivers side. The left springs should be mounted in the correct position, no matter what side of the road you´re driving on. If the car pulls to one side, then the front alignment for camber is off. Location: Sydney DS is definitely Drivers side as the other on is RH. I was thinking not so much if they are a different stiffness difference but the offset of the axle location stud. Maybe has something to do with the crowning of the road and driving on the right side. It doesnt pull to either side, feels quite neutral. Location: Southern Sweden - Sturkö island No, not to my knowledge at least. DS is definitely Drivers side as the other on is RH. You mean these cars had a different wheelbase LH/RH? No, that is not the case. Location: Sydney Can anyone explain why then, that the location distance of the axle is different from left to right? There is definitely a difference as was brought to my attention on the wheel aligning machine. The wheelbase on the RHS is slightly shorter than the LHS. This appears to be engineered that way by the specific spring location and different stud distances. Location: So. California It is probably just assembly tolerances - or your springs were made with poor tolerances. How far off are you talking about? Either that, or your car experienced a small accident sometime in its life that bent a couple of things slightly so it is hard to tell, but accumulates to a measurable amount. How far off are you talking about? The springs are aftermarket, fairly new and seem to be intentionally different and handed. 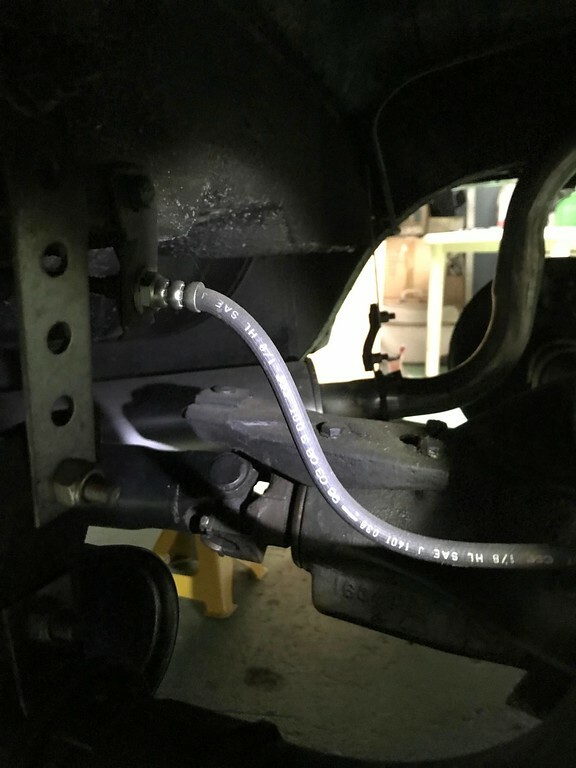 The overall lengths are different and the axle location stud is about 5/16th's shorter (location point) on the passenger side. Location: Southern Sweden - Sturkö island Could the difference in lenght actually be a different arch? Have you measured the main leafs from center of the front loop to center of rear loop? What is the problem with the car and/or the handling? The 4-wheel alignment equipment is actually to sensitive for the old cars. Like I said before, mainly curious as to why they would be like this. Location: Hilltown, PA "The 4-wheel alignment equipment is actually to sensitive for the old cars." "I do agree that the modern 4 wheel alignment equipment is just not suited to these cars at all :("
Do you have any idea how ridiculous those statements are? That's like saying your brand new Stanley Tape Measure is "too accurate" to use on an old house. Or better yet that these "new-fangled" heart defibrillators are "not suited" to your old hearts. Yes, current generation alignment equipment is more accurate and precise, and offers lots more information, than old school hub camber gauges and pointy sticks in the mud. But regardless of the format or source, alignment is alignment - you WANT more accurate readings, and honestly on an older car that might have seen some bad days the additional information is often extremely helpful. The fact that modern equipment has cast some doubt on the condition of your car doesn't indicate a fault with the alignment equipment - instead it is offering you an opportunity to find and possibly correct an underlying issue with your car. Sure it may drive well, but as someone who's done alignments on a very, very broad range of vehicles over many years I can attest that just because the car appears to go straight doesn't mean everything is right underneath. I can almost guarantee that if your wheelbase really is different side-to-side but you perceive that the vehicle goes straight/the steering wheel is straight, that if you have someone follow you they will tell you the car is "dog tracking" - possibly badly. If this is the case chances are good that even though the steering wheel appears straight, the steering box is not centered, and the front end is not truly aligned correctly. 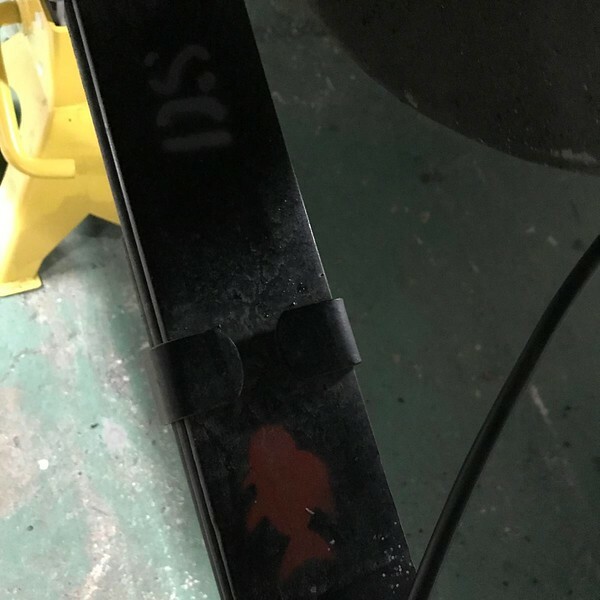 Take to time to follow the clues your alignment tech has given you. And start with a thorough understanding of the original specifications for your car - not just the basic alignment, but all of the relevant body/frame dimensions like wheelbase, ride height, and if specified any unusual terms like "offset" and uneven specifications/ranges side-to-side. There was a time when vehicles were aligned to compensate for road crown. This is not done anymore as it can cause uneven tire wear, especially with radial tires. Personally I never intentionally align a vehicle with different specs side-to-side - I want cars to track straight and true on a flat road. I have aligned my Desoto with the same equipment we use for brand new BMW's with no difficulty and excellent results. Interestingly enough the specifications for my Desoto are already part of the library available in the equipment. Location: Sydney Maybe so, but if you had witnessed the neanderthals that were operating the aligner when doing mine, I think they would have done better with sticks and mud. LMAO . . . .